It was the extended family Christmas celebration today, there were 20 people or so there. Most of my aunts, uncles, cousins and cousins kids were there. Just a lot of food, hanging out, playing Apples to Apples, hide and seek and all sorts of other stuff. It was great seeing everyone and it was at my Mom’s house (she hasn’t had the extended Christmas for years!) so that made it even better. As I was unloading the chairs and stuff from my car, my iPhone reminded me of something else Christmas-ish. So I hopped back into my car and drove over to Greenfield Village to catch the Christmas Fireworks! It’s only 3 miles from my house, so it was just a quick trip. They do a big old fashioned Christmas evening, if you’ve never been you need to go, and they end it with fireworks so I just drove nearby to a place where I could see them. They do it about six or seven times per season, they’re still doing it through the 27th of this month (but they sell out, so don’t wait). And drive safe if you’re heading out anywhere! Holiday Best Wishes For Everyone! Have a great a happy holiday and / or vacation! It’s easier to smile than to frown (it’s a scientific fact) and the results are always better (another fact). If you’re a few minutes late everyone will still be there. (I promise). Don’t fight with your parents! Or your kids! It really doesn’t matter who’s right. (Although, I sure like to be right). It’s not the dollar$ $pent, it’s really the thought. It really is, think about the times you’re gotten a useless gift, or thought they spent too much. (Yes, I know it’s nice to get expensive gifts). Be thankful for everything and everyone you have! It’s all you have so take care of all of it and them. I’m SO far behind for the holidays. All my family get togethers start this Friday and I’m just not ready. I guess I’ll have to worry about it for another few days and I’ll either be caught up or I won’t! So miraculously my mother is now on-line. I had it on my list of things to do but I had finally given up, she just didn’t seem that interested the last few times I talked to her about. About a week ago she decided she wanted to and I jumped on it; she came over we got a new laptop for her: HP 15.4 inch Dual Core, 1 GB RAM, 120 GB hard drive, Dual-Layer DVD burner w/LightScribe, SD chip reader (maybe reads more than that, with the media center “stuff” and a remote for that (which slides nicely into the laptop). BTW, that was $699 after rebate at Circuit City this week. A bit more machine than she needs right now but she won’t need anything else more than that for a while and it’s small enough she can bring it over when she has questions/problems instead of me having to always go over there. We went over to get a book for her and ended up with Easy Microsoft Windows Vista. Lots of pictures and very clear to read. We looked at some other ones even the seniors ones, and while they were very well written, the images were black & while and not every high resolution, very difficult to see. Mom’s pretty young, not 60 yet, but very low tech considering I’m her kid and I turned my step-dad into a geek before he passed away a few years ago. So I set her all up, it’s Vista so I’m not very familiar with it but I figured it out. Then I set up an easy to use home page for her to use with with Internet Explorer. I set her up a page at http://GaryLaPointe.com/mom/ and I can modify it whenever I want for her. But I stuck a bunch of stuff on it like local news, weather, on-line shopping and stuff. This includes some of my photos and links to trips she’s never seen and her musician granddaughter’s page. At some point she’ll have to learn favorites/bookmarkss, but for now it’s perfect for her. Take a peek and if you have any suggestions (either for the page or just some good introductory web sites. I’ll go over next week and hook up the wireless for her and she can set up in the corner of the dining room where she wants it. Right now she in my old attic bedroom. I think she’s going over to sign up for a 4 week (2 hours a night) computer class that starts next week at the community education center. So Mom seems pretty happy with the gifts that I got her for Christmas. In particular she likes the book Before You Leap: A Frog’s Eye View of Life’s Greatest Lessons by Kermit T. Frog. It’s very cute but seems like it really might have some interesting thoughts on it. I just spotted it at Borders, I hadn’t heard anything about it but it looked like something Mom might like. The other item was one she specifically asked for: a new vacuum. Her last vacuum was 34 years old, so it was about time. I settled on the Eureka Altima Bagless Vacuum and it was a good choice, she’s been playing around with it today. It’s got a great extendable duster thing that is self cleaning (I don’t even know how to describe it). It was a breeze to put together, three (3) screws and we were done (they could print the manual a little larger though!). It’s nice and light too. I had spotted it at Target and the line was horribly long so I figured I’d check out some other models and maybe come back. Later, Kelly mentioned it was the same one she just bought to replace hers and then it was on sale the next day so I took those two things as a sign and picked it up. She seems very happy with that and all the other items that Santa and I brought her!!! Very Excited for the Holidays!!! So I’m very excited about the holidays!!! Tomorrow my house will be packed with people. I’ve never had this many people in my condo so it’s going to be a tight fit. Twenty-eight people, I think about 10 will be kids and while I’ve generally got stuff for kids to do things, I don’t have much space for them to do it in, that’ll be the trick! Well, I’m off. I’ve got a bunch of little things that need to be done, but enough of everything is done so I don’t have to worry about it. I think I’m done with all the kids except one (and I think that will require a call to his parents since I’m clueless). So my last post wasn’t to make you believe that life isn’t good, it was just pointing out the blah things and not being in the mood for blogging (or even much blog reading). Life has been good and even today in general has been great. I got some gifts for a wedding and not only did I find somethings on the registry that I didn’t mind buying but I found things I wanted to buy for them and one was something I had even considered before reading the registry. I won’t list the items in case they’ve been keeping up on my blog. I went to the library to pick up two new books I had on reserver and they actually had a third waiting for me! The items consist of: Brother Odd (Koontz), Next (Crichton) and Wild Fire (DeMille). These plus some other one week books are going to generate some nice fines for the library. While I was at the library I found a few 25 cent paperbacks which I’ll take on my next vacation (and not need to bring back). Plus I drove by my local bar just as happy hour started and I popped in. So I’m currently blogging this over a Long Island Iced Tea and some and some free appetizers! Plus, it’s very Christmas-ish here thanks to Dawn. Other good things coming up: We’re celebrating Christmas at my place for the extended family in a few weeks and I’m way excited about that. I’m not exactly sure where I’m going to put 25 people in my condo but I’ll make it work. For the last few years my (Mom’s) extended family hasn’t celebrated Christmas anywhere near the 25th (we used to do it on the 24th every year) which is why I volunteered to have it on the 23rd. I actually sent out invites in April to make sure this would happen. And on top of that, next month I get to go on a warm sunny vacation to Costa Rica! In addition, many of the things in this post and the previous post gets a bunch of items off my 101 in 1001 list. I’ve completed 24 of 101 things done and I have 637 of 1001 days left to do them so I need to catch up a bit (23.76% of tasks done but 36.36% of the time had passed). The Costa Rica trip crosses off two (maybe three items), family Christmas knocks off two and the eye appointment is another. I might get a few more but those are guaranteed to be done in the next 60 days. So a few weeks ago I mentioned we were trying to get a domain name for Melissa. Well we finally settled on YourMelissa.com as the address. Once we got her set up on-line she then immediately titled the site “A Musing Melissa”! Where the hell was that idea when we were picking out a name?!? So she’s been talking about life, her kids, being single and figuring out who she is as her kids become adults and she gets used to handling life on her own. She’s been posting and I keep forgetting to send some traffic her way. So go on over to A Musing Melissa and say hello. I’m sure she’d love to get some comments and find some other blogs to read. I think I’ve got her all set up to handle gravatars so if you’ve got one she’ll think that’s especially cool to see your icons, which then might motivate her to post comments on other sites (I think she’s just been lurking so far) she still thinks of this as a “parallel universe”. So we’re trying to set up a domain name for Melissa so she can start blogging. I went looking for a domain name for her to buy and of course Melissa.com was taken (but I had to check) and they offered suggestions for us. Suggestions like BestMelissa.com and SuperMelissa.com (my first choice) and then I noticed an odd one, so I’m “Hey, Melissa, They’ve got RayLovesMelissa.com, it’s the only one I see with ”love“ in it, how weird is that?! ?” Harry was Melissa’s husband that died last year and Ray was what everyone his family called him. So that was pretty bizarre (but wait! ), “Oh Melissa, I was wrong here’s another one DannyLovesMelissa.com so it’s not so strange”. But it turns out that was the name of her first husband! We looked harder and that was the only one with “love” in it, how strange is that? I always like the idea of having your own domain name. Then you can switch hosts and take your name with you. We’re hosting her at BlogSpot and just frame the page in it (or maybe we’ll redirect). I can’t believe that they’re not set up to use your own name and charge you for it (or make you buy it from them). So we didn’t pick SuperMelissa so it’s still available if you want it. I’ll tell you her address once she gets settled in. 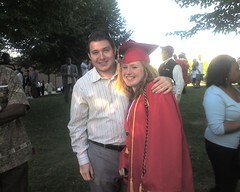 This is Bekah (and brother Darren) right after graduation. She graduated from Sexton High in Lansing, Michigan. It was at Breslin Center at MSU. Happy Mother’s Day! Thanks Mom! I’m off to take her to dinner somewhere, probably somewhere with a short line since it is Mother’s Day and we’re still not connecting for a few more hours (we’re not organized nor fussy enough to make reservations in advance). She just got back from vacation last night so I had already dropped some loot off at her house in case I didn’t see her today (as of yesterday noon, we still didn’t know). She did the single Mom thing in raising me, which had to be rough, and she did a great job!! Thanks Mom! So it’s been a relatively bad week. I’m still sick (two weeks now) and they can’t figure out what’s up. I haven’t been sleeping well (got about 3-4 hours last night). I’ve had numerous overlapping appointments and meetings that made the week pretty goofy. I got a phone call from a buddy in the emergency room who wrapped his car around a pole (literally). Spent lots of time in the hospital and checking on things. I’ve been driving around with tin cans in my car since Monday and haven’t had time to take them back. He’s out of the hospital and fine now. I can’t beleive he’s okay with the shape the car was in. Comcast cable appointment at 10am-Noon tomorrow. After they made me test all the stuff I already tested. + Dinner was delicious. I’m off to shower and to bed! http://GarySaid.com/topics/friends-family/ generated Tuesday, April 23rd 2019 at 4:48:22 am EDT (in 215 queries in 0.965 seconds).